In a post-apocalyptic future where humans live underground, a group of friends dreams of what life is like above ground. 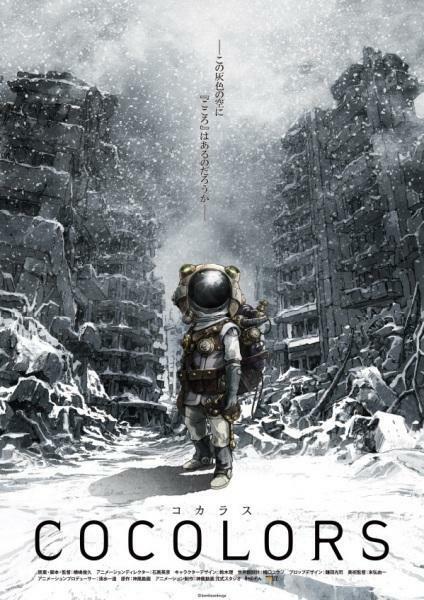 Beautiful yet bleak may be the best way to describe director Toshihisa Yokoshima's animated featurette "Cocolors." In what appears to be a post-apocalyptic world, humans have moved underground. They spend their lives shuttered away in special suits out of fear of the toxic air and the ash that fills the atmosphere that trickles down like falling snow. A group of young friends, including Fuyu and Aki, dreams of what it was once like in the world above ground, in particular, what the sky looked like before darkness and ash blanketed the atmosphere. They draw pictures of what they imagine the world above to be like. As they get older, the reality of their world becomes more apparent as they do what they can to keep hope alive even though all around them people are dying. "Cocolors" is animated in a breathtakingly gorgeous, insanely detailed way with an industrial yet somewhat fantastical appearance. We really enjoy the concept and its themes of friendship and hope, though it may seem to lack these traits on the surface. Overall, this is a sad tale about a dystopic future and the kids who grow up never really knowing what the world looks like outside of their imagination. It is interesting that one can find hope in such a sorrowful story, but this group of friends finds a reason for joy in an otherwise depressing, cold, mechanical looking world. The style of animation and the design of the characters can only be described as dystopian steampunk. The characters dress in what appear to be bulky astronaut suits. This is our one and only complaint. It took us a little while to be able to tell all of the individual characters apart from one another and to figure out who each character was based on the differences in their outfits. "Cocolors" is a somber animated movie that skirts the line between feature-length and short film. It is cold on the outside as it deals with pain, sickness, death, and longing, but it is also extremely intimate as friends rely on each other for happiness, joy, and imagination despite imminent death. With stellar animation, interesting relationships, and a unique premise, it is definitely worth checking out wherever and whenever it is available.